We have our favorite list of preferred flowers, which we love to plant all the time. However, it can be frustrating and time-consuming. There is a procedure that has to be repeated, and there is wait for a certain amount of time, and the plant gets to its usual size. Always make sure you do your research about any plant you consider growing in your garden. It’s good to conduct some research online to find new ways of planting plants and herbs, rather than growing it from scratch, by seeds. Growing your plants from cuttings, is a much efficient way to add a new plant into your garden. It will require less time and is at a very affordable, low cost. Growing the cuttings from existing herbs and plants, is totally helpful and reasonable. Its a fact that your trimmings, being full-grown and at proper height and size, will grow much quicker and will likely resemble their parent plant. If you end up deciding to grow a plant entirely from scratch, by using seeds, you are adding the risks of growing a plant that will be less-successful, and with no fruit. In gardening, you need some luck in order to grow a healthy plant, in order to raise the stock of herbs and plants in the garden. Another great part about this process is, you can choose herbs and plants with good characteristics and a chance of receiving the same, plant is really high, and thats why many people are utilizing trimmings over seeds. Don’t forget, you can also trade cuttings with neighbors and friends, it will save you and them money while extending the trifecta of herbs and plants. Some plants can be grown from leaf-trimmings or from the root, while others can be grown from various different parts of the stem. Hardwood cuttings- Taken in the fall and winter, ready in the spring. These cuttings are usually taken from old and woody stems, then prepped when shrubs begin to shred its leaves. By doing this, the plants will be abundant in roots that can be planted in the Spring. Softwood cuttings- Taken from new stems, these cuttings should be kept in soil until roots are produced, which isn’t too slow of a process. These can be taken in the late part of the Spring season or early Summer, they tend to be ready in the same exact season. Semi-ripe cuttings- Somewhere between hard and softwood, these stems are semi-mature while the root needs more time to ensure further growth. That is why these trimmings are harvested in summer, where the climate will aid in growth. Heel cuttings- Taken from old, mature roots. These are taken from the parent root, which means they have a part in between the heel or main stem. 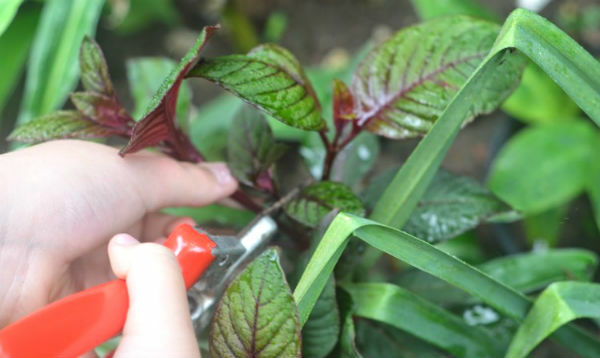 Tip cuttings- These are so typical for growing herbs. Taken from the growing tip, below a node that is about 6-8 inches long. Basal cuttings- About 6-10 inches long, you can cut this one close as possible to the main stem. Leaf cuttings- Similar to succulents, there are many plants which can grow plants from leaves, unlike snake plants and begonias, which actually grow their plants from parts of its stem. 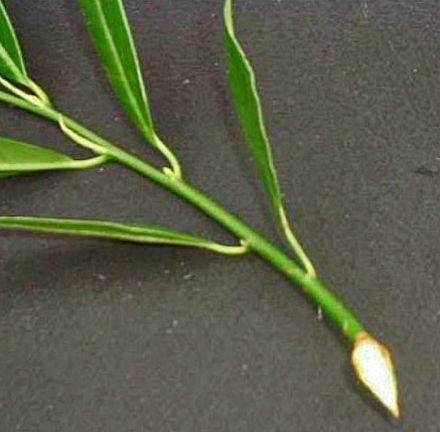 Stem sections- Cane-forming plants can be grown from their long stems. You must be careful of which side isn’t the root and which is, that way both ends of the trimmings are even. Root sections- As previously mentioned, some plants efficiently grow better from root cuttings than stem cuttings. The sumac or Californian tree poppy, for example are better grown from root cuttings. Before planting any cuttings, prep up for the process of rooting. Ex. fleshy stems have to be kept for up to a few days in order to form woody cuttings or callus, then remove its outer layer so the cambial tissue is exposed. After preparing the cuttings, you must keep them moist. Combine both perlite or sand, and peat moss to lock in moisture. At this point, fertilizer isn’t a good option and neither is garden soil. Avoiding these two will help your plants avoid disease organisms. In fact, you can create a humid environment, by covering the pots. This will help growth, but keep in mind that applying moisture is just as imperative as drainage. Be careful of growing the plant roots in water, because the root can be very fragile and can be easily ruined. If you decide to grow plants that take a longer amount of time to root, consider utilizing hormones. It’s fertilizer that is mostly avoided in case of the usage of hormones. 1.Lavender– Lavender is grown from tip cuttings, around 3 inches, and it’s rooted in a cold frame. Then, it’s transplanted into garden beds, after 4 to 6 weeks. 2. Rosemary– For new rosemary plant, take tip cuttings in the spring or basal or heel cuttings in fall, rooted in cold frames. Take few cuttings in separate pots, covered with plastic dome, in order to avoid a great number of rosemary plants. 3. Rose– Rose is grown from hardwood cuttings, thick as a pencil, during fall and remember to water them during winter period. 4. Thyme- Thyme is grown from tip cuttings during the summer, you can take several types of thyme and put them in a moist potting medium. 5. Comfrey– Comfrey is grown from root cuttings, in spring or fall. The root cuttings are from the parent plant, from its root and planted in worked bed, covered with mulch. 6. Basil– Basil can be grown in both ways, from seeds and from tip cuttings. Take the cuttings anytime of the year and keep it in a warm place, but away from the sun. 7. Snake plant– You can make a great number of plants from one snake plant only. Take 2 to 3 sections of the leaf and use it to grow new plants. However, new plants will not carry the original variegation and sections of rhizomes are planted in order to keep the variegation. 8. Holly– Take cuttings from female bush, in fall. Dip them in hormone powder and put them in a pot in a moist rooting medium. Keep the pots inside. 9. African violets– This plant is grown from young leaves of the leafy stalk. Poke a hole with a chopstick at the angle of 70-degree, insert a stalk, put it in a tray of moist compost and sand and keep it in a bright place. 10. Geranium– It is best if you wilt the parent plant in order for the cuttings to root better. 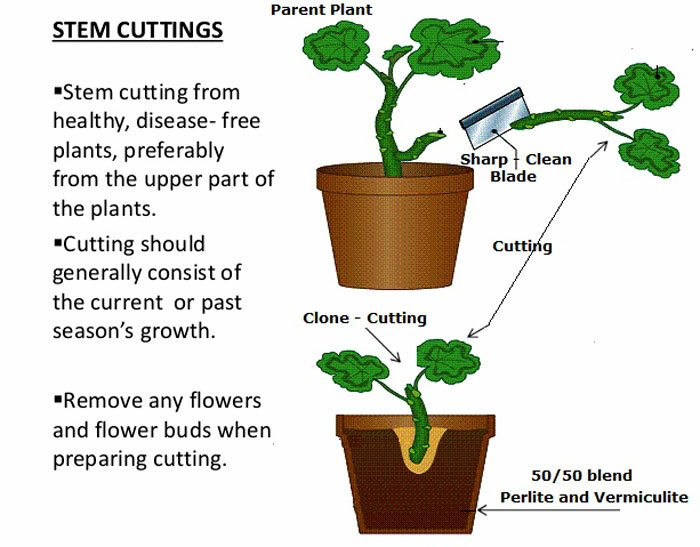 Long cuttings should be rooted and cut 12 hours after watering the parent plant. 11. 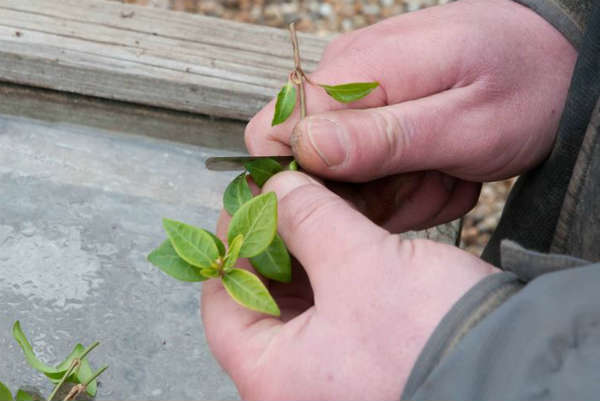 Fuchsia– Take tip cuttings during spring, together with 3 pairs of leaves, put them in a moist mixture of compost and sand and cover it for warmth. Plant them during summer days in order to get flowers. 12. Sage- This plant is grown from semi-ripe basal cuttings in fall, kept in medium warm and a moist atmosphere and they are transplanted during spring. 13. Californian tree poppy– Take 3 inch sections from roots in December, put them in a tray of moist mixture from compost and sand. During the summer, it’s planted outside. 14. Horseradish– Take 3 inch sections from the root in spring and plant them in a garden bed, a foot apart. 15. Weigela– Take softwood or semi-ripe cuttings in spring or early summer or hardwood cuttings in fall. Softwood cuttings are planted in fall and hardwood cuttings are kept over the winter in a cold frame and planted the following spring. 16. Hydrangea– This plant is grown from tip cuttings with 3 to 4 leaves, the lowest pair is removed, the stem is trimmed closer to the node and it’s put in a moist rooting medium under plastic sheets. 17. Aluminum plant– Aluminum plant is grown similarly to Hydrangea. Tip cuttings are taken, stripped the lower leaves and the stem is trimmed at the node. Remember to keep the moist, until you notice new growth. 18. Dumb cane– Take leafy heads and leave them a day or two to form a callus. Put them in individual containers, on warm and bright place. Take bare canes, 2 inches above the soil and divide them into 3 inch sections in trays containing compost and peat. Keep it covered until the shoots grow over the soil line. 19. Chinese evergreen– Take tip cuttings, put them in a moist mixture of compost and sand. Make 3 inch sections of the stem and put them in a tray, horizontally, into a moist sand-peat mixture, cover them partially with sand and close them with transparent plastic. New plants are put in separate pots. 20. 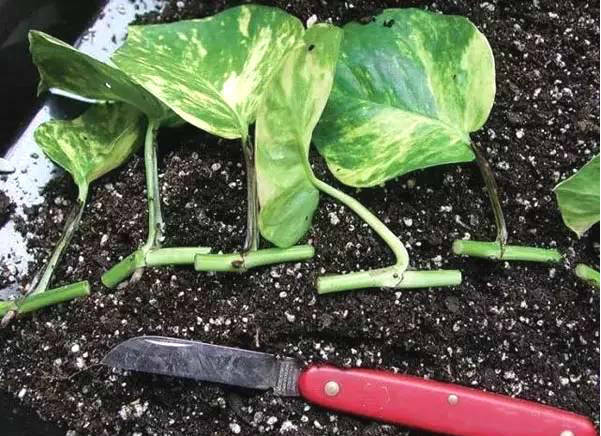 Philodendrons– This plant is grown from tip cuttings with 2 to 3 nodes, they grow easiest, when the root forms and they sometimes grow from the tip before the growth of the root. Moreover, mid sections with 2 to 3 nodes can also work, but they may require a longer development period.